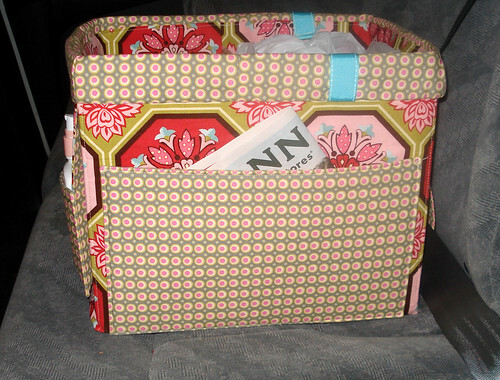 The Car Organizer Pattern is available here. I am really excited about how this pattern turned out! Huge thanks to my test-sewers for their suggestions and design suggestions. On the floor in the front of the van. I took Karen’s suggestion (great idea, Karen!) to have a pocket for recharging the phone and to hold some pens. Fabric combo on this one is Midwest Modern and a pillowcase I had. Who knew I’d become a plastic surgeon during this process? And the best part? 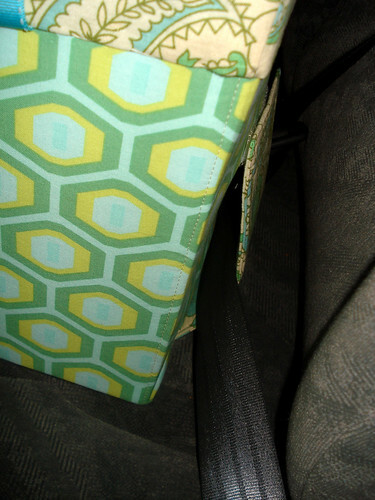 The seatbelt flap that prevents the organizer from flying off the seat! All credit for this design element goes to Lara and her hubby. Thank you! And finally, one more cute fabric combo- Midwest modern and Ginger Blossom. How can I be so excited about a box? I don’t know, but I am! Pattern is available on my site here. My latest pattern is called Small Books. 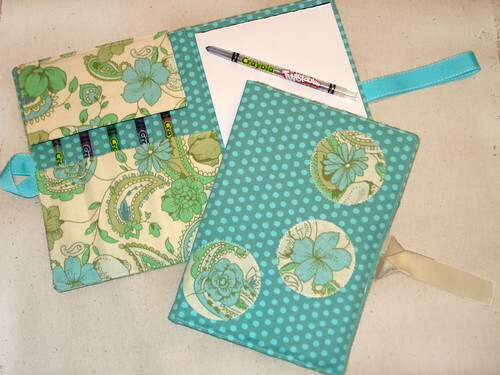 It includes the Little Artist Drawing Case, Quilted Brag Book, and Mini Patchfolio. As my kids used their Little Artist Drawing Cases that I made earlier this year, a design flaw became apparent: the crayons fell out when they turned their cases upside down. Not good, especially at the germy doctor’s office where they have to crawl under chairs to pick them up. I’ve added a crayon flap to remedy this. The above fabric is clearanced ($5 for 2, folks!) PBTeen pillowcases. 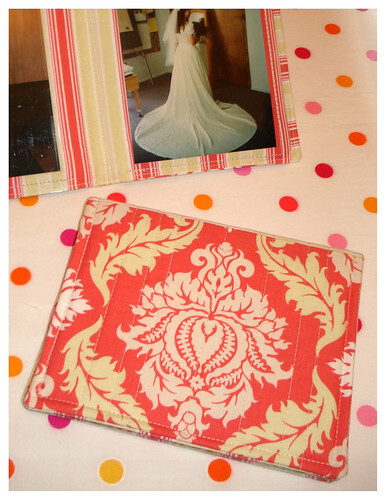 I was having trouble with the Quilted Brag Book initially because I was using soft vinyl (the kind on a roll) for the photo pockets. The vinyl was giving me problems because it kept sticking to the pictures and making funky-looking sticky spots. Then I discovered vinyl plastic sheets (also seen here). It’s perfect for this project. 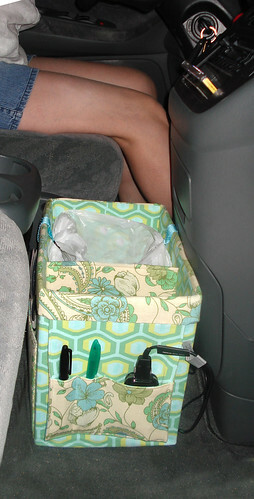 Although it wasn’t created for this use, it’s sewable, durable and doesn’t stick to the pictures. Fabric is the last of my pink Joel Dewberry. 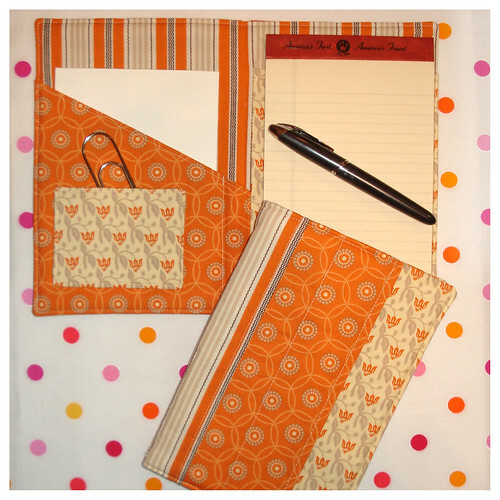 This baby is a 16-page booklet with 8 pattern sheets – my largest pattern ever, weighing in at 5 ounces. Huge, HUGE thanks to Melanie for sewing through these patterns for me. She has a great eye for details and caught things I didn’t notice. And also to Cindy for sewing through the Mini Patchfolio with me late into the night last month. I couldn’t do it without you guys! It’s available in the shop. I have been obsessed lately. Obsessed with making something. And now I’ve made about 20 of them. 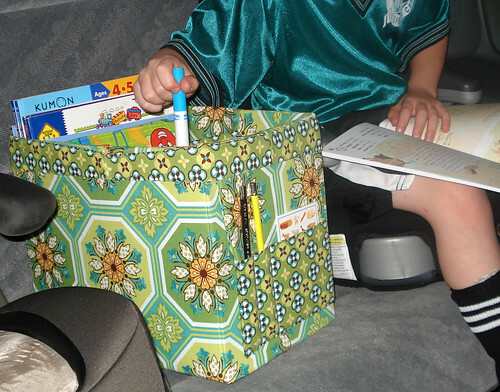 It all started when a friend of mine asked me to come to a mom and daughter’s group and do a little sewing craft. (I’m not sure if she reads this blog, but if so, Hi Sarah!!!) I tried to think of something small and easy. Something that would be fun for new and experienced sewers. Something that we could do cheaply. After a couple days of deep thought, I came up with an idea. I even started dreaming about it in my sleep. Then in my craziness, I thought I’d put together a pattern. Well, what I thought would be easy turned into this big project. The pattern went to the top of the list of crafty things to get done and here I am with a new pattern and a bunch of new pincushions. These footed baking cups are so fun! Thanks for posting about them, Joanna! Pattern is in the shop. Now before anyone thinks all I do is sit around cranking out patterns, this one has been in the “almost done” phase for quite a while. It feels like all I’ve done for the last week is finalize this pattern (which involved a lot of sewing (fun!) and some trips to Home Depot (also fun!)) and looking up copyright stuff (not so much fun). Hey, is anyone going to tell her that the picture is sideways? Oh Lotus fabric, how beautiful I find thee. HUGE thanks to Katie who whipped up not 1, but 2 patchfolios in one week, to test sew this pattern for me. She is the reason this patchfolio is as sturdy as it is. Thanks, Katie! These girls are some models that didn’t make the cut for the cover shot. But they were such good sports about it. Not a complaint (“Awww! Why can’t I be on the cover?”) out of either of them, which is such a nice thing for this Mama. Patterns are, of course, in my shop. Thanks to everyone who’s been asking how I’m doing! You gals are so nice! I’m almost 4 weeks post surgery and doing a lot better. My body is craving exercise, but I hurt when anything in my tummy area does anything remotely similar to jiggling so for now I walk slowly, avoid walking down stairs, and dream of when I can get up early and walk with my walking buddy Yvonne. 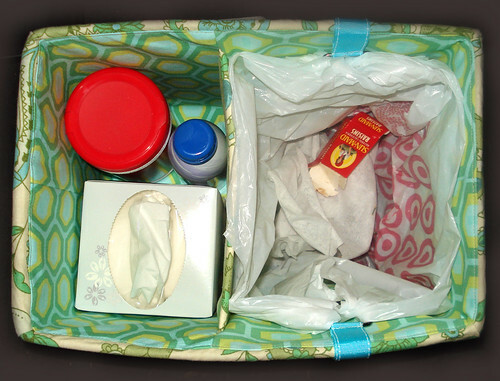 The cover shot bag is made up in Amy Butler’s Nigella. This pattern is available here. 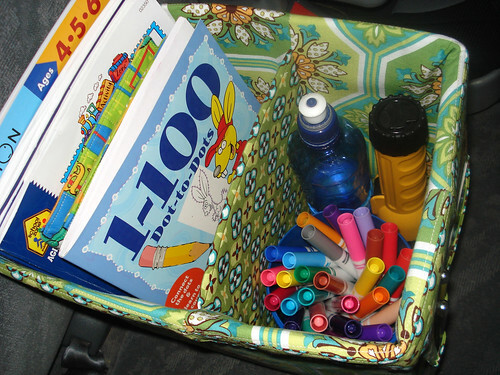 I can hardly believe it – the diaper bag pattern is done! Whew! That took what felt like forever. Please pardon the lame name. I am seriously lacking in the naming department. It took me forever to come up with a blog name last year and hubby wasn’t much help with his suggestions that were always something like this: super craftafragalistic expiolodocious. 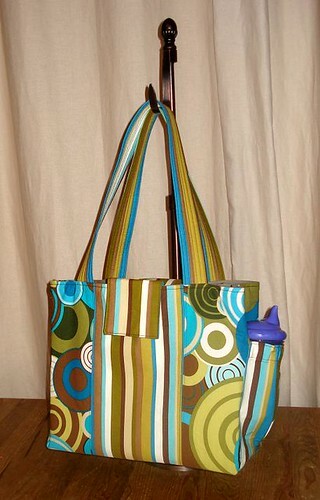 Or in this case: super diaper bagalistic expiolodocious. Sue really came through for me and test sewed the bag and edited the pattern in less than 2 days. Your comments were valuable, Sue. Thank you! You can see her bag here. I had all these ideas about how I wanted the cover to look. But when it comes right down to it, trying to get together with a friend who has baby and setting up a photo shoot just doesn’t rank high on the list of things that are easily done. That, and pattern naming, you know. However, I am open to suggestions if anyone has a name they think is just perfect. But isn’t the pattern done, you say? Well, yes, but I’ll change the name in a heartbeat for the second printing. Soon I hope to finish off the Patchfolio pattern, then take a break from pattern writing for a while. It is finished! IT REALLY IS! I’m so excited – this pattern-writing thing has taken a lot of time and energy, and even if it doesn’t earn me a dollar, I feel really good about being able to put this together in a way that I’m proud of. First of all, I’d like to send huge hugs and thanks to Kathy and Kimberly who test-sewed through the pattern and gave me wonderful suggestions, encouragement, and comments on how to make it better. Ladies, your copy of the pattern is on it’s way to you! I realize that I’m no famous, hot-shot crafter, but I wanted to make this pattern as professional and user-friendly as possible. One of the things that drives me nuts about traditional patterns is that they are on huge sheets of paper that I must unfold to use and somehow refold to squeeze back into an envelope. So starting with the layout, I made the pattern into a booklet that is stapled down the middle. No more folding and refolding. When you get to the end of one section, just turn the page. The pattern pieces are by no means rocket science. Everything is at right angles, but I have paid $10 for a pattern before that told me to cut a piece 12″x13″ square without a pattern piece and I seriously felt ripped off. At the time, my cutting mat was very small and I wasn’t confident at getting my squares squared up. I got out my paper cutter and made my own pattern pieces, feeling increasingly irritated. So even though the Seamstress Apron is made with all rectangles, I have included a sheet of pattern pieces for the seamstress that might not have a rotary cutter. This adds significantly to my cost ($2 per sheet of large-format paper), but it is really important to me. Lastly, I couldn’t afford to hire a model or a photographer, and hubby wasn’t going to model, so yours truly is modeling the apron. On the day of my self-imposed photo shoot day, I was having a seriously ugly-feeling day. Now these don’t happen to me often, but when they do, the feeling is strong. Not only did I feel ugly, but when I went out grocery shopping, I couldn’t help feeling everyone else was ugly too! That has never happened to me before! It must have some sort of bizarre modeling stage fright. So I guess the one thing I wish I could do better is to have a more professional-looking cover shot. So the pattern is here. I’ve listed it in my shop. It’s not going to make me rich, I know, but I feel really good about it. Whew! 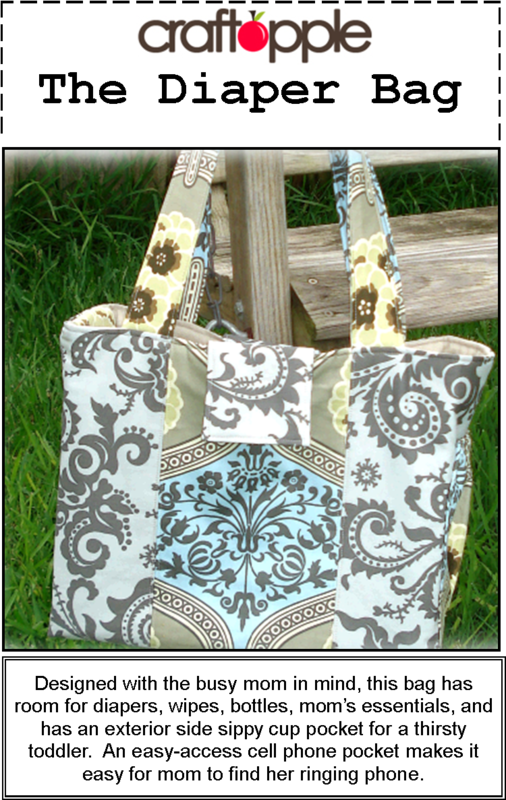 I made this one with fabric from the Bohemian line by AnnaMaria Horner. Purdy fabric!